Jupiter,Mercury and Venus are conjunct with Natal Sun and Venus. Mars is conjunct with Natal Jupiter. On May 29th, Mercury conjuncts with Natal Mars and trines Natal Moon. On May 31, Venus also trines Natal Moon. At least to me it looks that Nifty`s planets are mostly positive with some negativity only towards the weekend." What is in store for the week ahead? 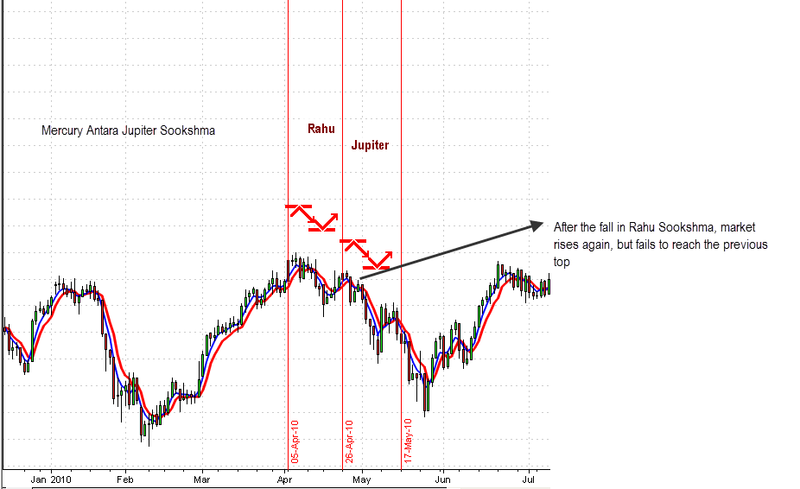 Latitude.So our expectation is an uptrend from June 03, sees a blip on June 06 and then climbs into a crowded Lunar situation between June 10 and 13.Incidentally, from June 11, we have Venus Antara Jupiter Sookshma..
How has Jupiter sookshma behaved in the past? 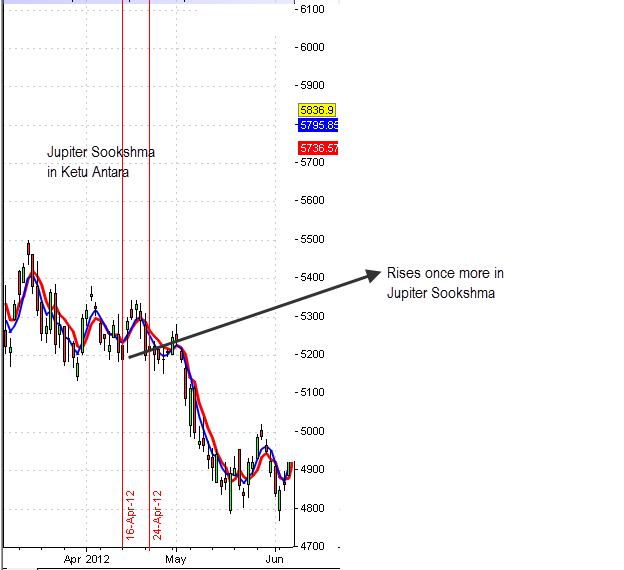 Every time we had seen the market rise one more time in Jupiter sookshma.Shall we expect the same once again now? 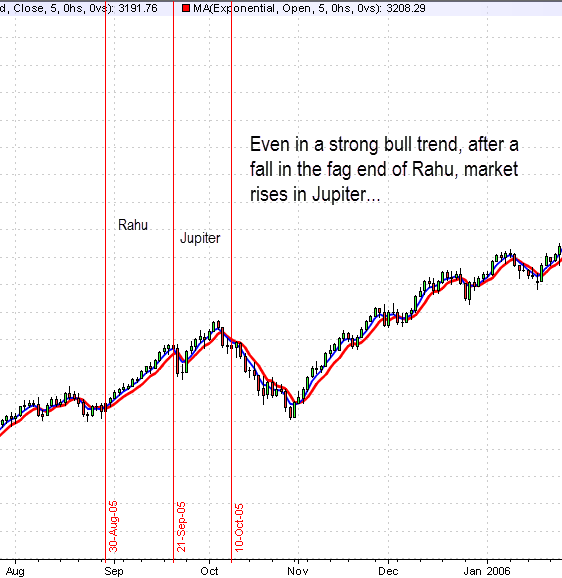 sir , so is this rise till june 6th the topping out and can we expect a good fall later in june july 2013. request your guidance. Astrologically it looks to be a distribution formation.I have discussed the reasons elaborately over several posts. Technically also there are two possibilities which point out to a top formation. 1. If we are in an irregular B wave formation then only the last upleg, C of B is pending, which should then make wave for an impulsive C wave downwards. 2. If we are in the last g leg of D wave of a large diametric then once g tops out then we will see the first downwave of E wave of such a diametric. Now if this current wavelet is g, then the initial down move could be swift.My bias is towards 1. above. Of course only the Nifty Gods know what is in store. 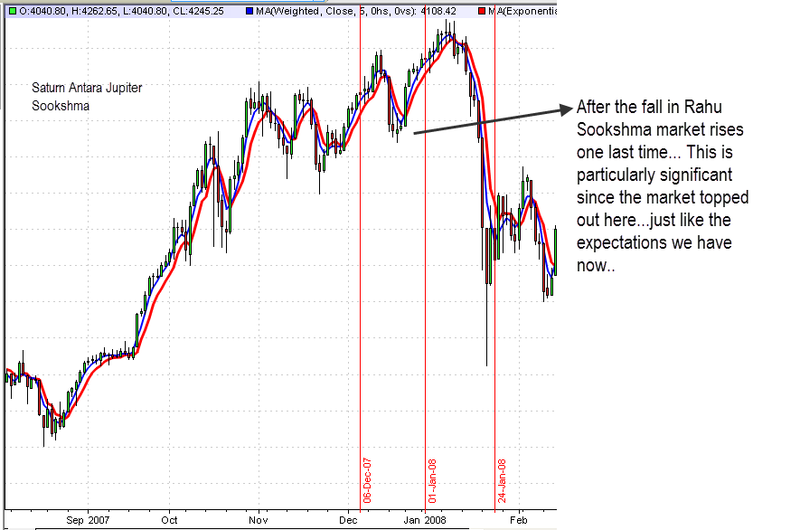 Since volatility is going to rise even more, it will be very prudent to only operate with tight stoplosses. It is absolutely fascinating! In fact there are so many facets and areas to be explored that at times it is so overwhelming. And time just flies once we sit with this science! As shriram said, a wonderful study of heavens. What makes me salute you is the consistent way you have been sharing and guiding us. Kudos to you and to your work. Dear Suresh, The market is going to be a traders market from now according to me. Since 2010 nifty has been too range bound and the average daily range of nifty has been terrible. VIX too has fallen as a result of that. But now like you mentioned about high volatility and range,I can see the market being good in terms of movement and volatility. I expect VIX to be in the range of 19-26 soon.This is when I expect a lot of action.Its not far away.